THE council's annual general meeting will be held this Thursday, December 12, in the New Norfolk Courthouse at 5pm. 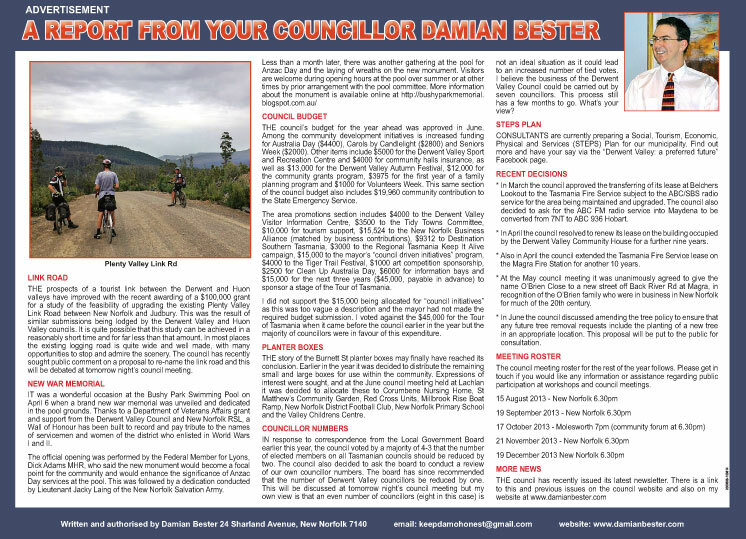 I encourage all interested residents and ratepayers to download a copy of the annual report from the council website here, or to obtain a hardcopy from the council chambers. Councillors have today been provided with the following update on the progress of works at Willow Court. Thanks to project officer Brett Noble for this information. As many would have noticed, there is currently considerably activity at The Barracks. Over the last couple of weeks, all the windows facing into The Barracks courtyard have been restored to working order. The windows retain all the marks of their 180 years of life – patches, different paint layers, repairs, and breaks - but are now in working order. Some very intriguing metal work, hand stamped with the ‘convict arrow’, was uncovered during this work. The ‘convict arrow’ was also found on many of the window frames. Work has also begun on a couple of the original doors, as a test of what this work will entail. In addition, specialist renderers have been working on the verandah plinth, removing cement render and bits of loose render, ahead of applying a poultice. The poultice will be on for a few weeks, to draw out the moisture and salts that had been trapped in the masonry, before a new lime render is applied. Part of this work involved the removal of some of the brick pavers that were hard against the verandah plinth, and a little excavation along the face of the plinth. This work has shown that along the southern side of the building the original ground level was much lower that at present. Behind the scenes, the head contractor requests for tenders is nearing completion, which should see the selection of a head contractor in the next week. As you will recall, part of the selection criteria for this work is the involvement of local sub-contractors. THE proposal to establish a Zap Fitness centre in New Norfolk required council approval and was the subject of much discussion in the community. There was a perception that approval might prove difficult to obtain, but in the end no councillor spoke against it at tonight's council meeting. Councillors Evans, Shaw and Shoobridge were absent and Cr Lester stepped out after declaring an interest. "Mr Acting Mayor, six months ago when we were discussing another development, I quoted from the planning scheme where it states the intent of preserving commercial activity in our central business district. That is what this application does. "We have one of Tasmania’s leading businessmen wanting to expand his fitness centre operations to New Norfolk and while I do not think this is the best use for such a large shop, given the state of our economy I am pleased to see any business activity taking place there. "This development is being proposed as a place of assembly and our planning scheme describes this as being for recreational, social, entertainment, cultural or religious purposes. The proposed fitness centre could well be described as meeting several of those criteria, not least 'recreational'. 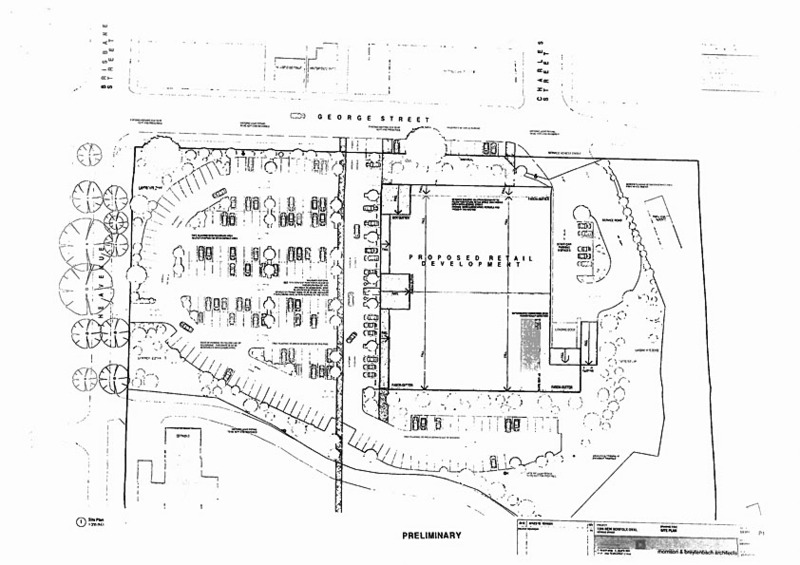 "The problem area is parking but we are able to exercise some discretion. There is a Zap Fitness Centre near my workplace and I have seen its customers arrive on bicycles, skateboards, and on foot as well as by car. The use of these centres seems quite social and I have seen people sharing a car. 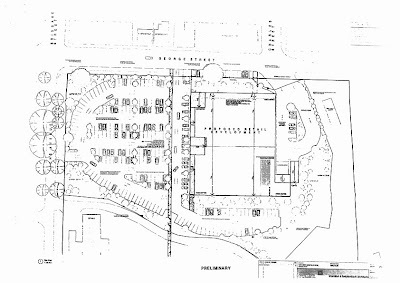 "The use of the proposed fitness centre will be spread throughout the day and I believe sufficient parking is available within a short walk in almost any direction. Charging the developer more than $10,000 in lieu of the missing parking spaces will not result in any extra parking spaces being created. I believe charging this fee could jeopardise the whole project. I believe we should waive the fee and approve this centre." 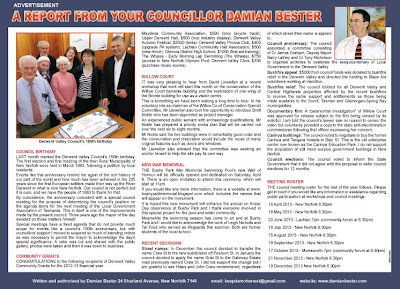 THE latest issue of the Derwent Valley Council newsletter (Spring 2013) is available for downloading from the council website here. YESTERDAY I was asked for an update on the exploration of the "tunnel" beneath New Norfolk and although there does not seem to have been much progress on that front I was able to advise that the mayor had told a recent council workshop that he believes there are two tunnels running roughly parallel to each other under Burnett St. The theory is that one is the disused sewer and the other is the historical tunnel reputedly used by convicts, patients or soldiers to travel underground between Willow Court and the river. I do not know what evidence exists to support this view and look forward to further investigations being carried out. Whatever we find will add to the story of Willow Court and its significance as a historic site of national importance. Needless to say, I have a hardhat and headlamp ready to go! COLUMNIST Leo Schofield's latest missive on the topic of Willow Court indicates that he is considerably out of touch with progress on that site. 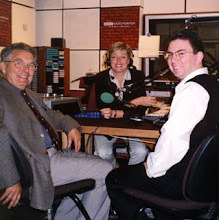 While Mr Schofield's earliest remarks about Willow Court quite rightly focused on the council's neglect of the historic site, he last year took aim at the people of New Norfolk and that is when the lost the support of many who had appreciated the light he was shining on the urgent need for action on Willow Court. His attack on New Norfolk and its people continued in yesterday's issue of the Mercury newspaper's Saturday Magazine. This latest contribution highlights the need for Mr Schofield to better acquaint himself with the progress being made at Willow Court as he appears to be writing from an outdated and ill-informed perspective. Much of what he called for in Saturday's column has already been done. The council took far too long to take effective action on the preservation and development of Willow Court and it was this decade of neglect that prompted me to seek election in 2009. Progress was not as rapid as I would have hoped in my first year or two on council, but great strides have been made in the last 18 months - and this year in particular. Mr Schofield is entitled to continue to express his opinion but his readers will be better served by a factual account that does not unfairly and unnecessarily malign all residents of New Norfolk. His opinion should not be construed to be that of the newspaper itself. 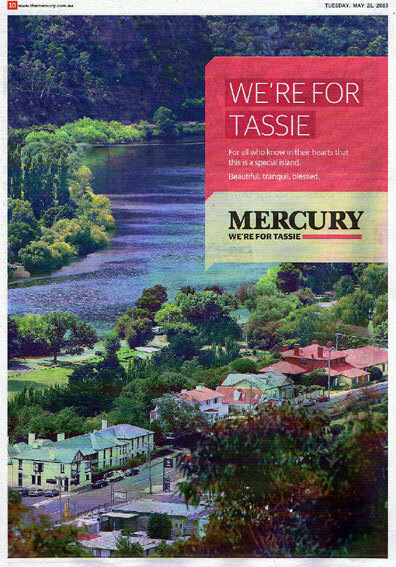 I am employed by the Mercury and I believe its opinion of the town is more accurately reflected by its selection of the stunning photo, left, as part of its latest marketing campaign. So fair go, Leo. Why not put your passion to good use and offer your services to the Willow Court Conservation Special Committee rather than take potshots from the sidelines? With the enactment on 20 June 2013 of the Local Government Amendment (Elections) Act 2013 and the making of the Local Government (Number of Councillors) Order 2013, the Local Government (Casual Vacancies) Order 2013, and the Local Government (Elections) Order 2013, the Tasmanian Electoral Commission can now provide the following advice concerning local government elections. Ordinary elections for all 29 councils have been deferred until 2014, when all councillors and aldermen, and mayors and deputy mayors, will be elected for a 4 year term ending in 2018. 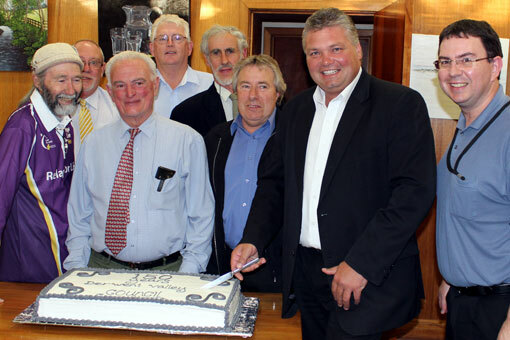 The terms of office of councillors elected in both 2009 and 2011 will end in 2014. For the remaining 23 councils, vacancies occurring between now and 13 March 2014 will be filled by recount or by-election, as appropriate. For the 6 councils listed above, councillor or alderman vacancies will only be filled if the number of remaining councillors or aldermen has fallen below the future number. Accordingly, the TEC will soon commence action to fill an existing vacancy on West Coast Council by recount, and will take no action to fill a vacancy on Tasman Council. Vacancies occurring after 13 March 2014 will generally not be filled in any event. 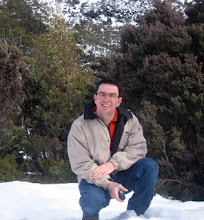 A councillor or alderman who becomes a Member of the Tasmanian Parliament may now only hold both offices for 12 months. A Member of the Tasmanian Parliament who becomes a councillor or alderman may only hold both offices for 30 days. The TEC expects that counting ballot papers will be a significantly more complex process under the new arrangements and is exploring options for fully computerised counting for larger councils. Derwent Valley Council is pleased to announce that it has kept rate increases to a minimum again this year. “Council voted to accept the draft budget presented to them with rate increases for the 2013–2014 year set to be 3.5%,” Mayor Martyn Evans said. 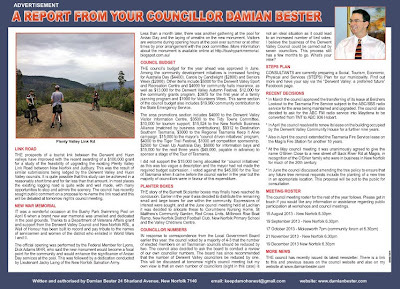 Derwent Valley Council was one of the first in Tasmania to introduce public budget submissions to its budgetary process. “This gives members of the public the opportunity to submit projects to be funded in the budget, these may be community or infrastructure projects, and can be things that Council would sometimes overlook in day to day business. Installation of guard rails on Backriver Road, in the vicinity of Fairview Primary to increase safety for both motorists and pedestrians. Financial support for the Tiger Trail Festival, an initiative of the Mt Field Tourism Group and community in the area. Erosion prevention along the Esplanade. “Council is mindful of the financial pressures that household budgets face, and works to keep a balance between keeping rate increases to a minimum while still providing essential services to residents,” Martyn Evans said. “Progress continues to be made on restoration works at Willow Court” Chairman of the Derwent Valley Councils Willow Court Conservation Special Committee David Llewellyn said today. 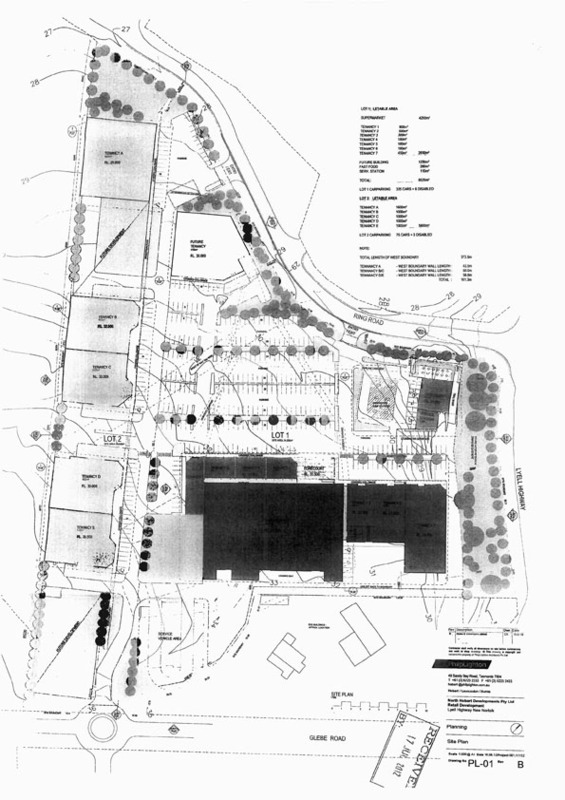 “Expressions of interest for work on the Barracks, Bronte and landscaping surroundings were received by the Committee at its June 13th meeting and I’m very pleased to say that a high number of quality submissions were received”. The installation of new underground electricity now completed to the site has resulted in new lighting down the length of the avenue and the start of works to repair the broken windows in Bronte is progressing. Providing lights and electricity to the site and basic repair works are a few of the many current activities overseen by the Committee. David Llewellyn emphasised that the Committee is actively pursuing the use of local contractors for many aspects of the work, and has already used a number of local contractors. “We expect to award contracts shortly to prepare the necessary planning and heritage documentation to undertake the major restoration and redevelopment works at The Barracks and Bronte, including full landscaping of the heritage precinct”, Mr Llewellyn said. “The joint funding between local, State and Federal government for the heritage precinct project is an important collaboration”, David Llewellyn said. THE following media releases are reproduced here without alteration. The deputy premier's statement beats around the bush on the topic of compulsory voting at council elections, which was defeated in the Legislative Council. The Deputy Premier Bryan Green tonight welcomed the passing of major local government reforms by the Legislative Council. 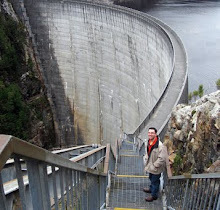 “These are very important reforms that will help re-shape the future of local government in Tasmania,” Mr Green said. “We put the reforms forward in good faith and now we will deal with the amended legislation when it returns to the Lower House to give local government certainty. “All-in, all-out council elections will enable councils to focus on delivering their policies over a fixed-term like all other levels of government. Rather than elections for half the council ever two years this will provide continuity for our leaders in local government and the communities they represent. These changes will help ensure councils are even more accountable and responsive to their communities, while also letting them get on with the job that voters have elected them to do. Mr Green said preventing dual representation would ensure that elected representatives can focus all of their efforts on the interests of their local communities. “This will relieve elected representatives of conflicting demands on their time. Mr Green said he recognised the move towards compulsory voting was not supported by all councils. “The aim of compulsory voting was to help lift participation and make local government more representative of the communities they represent,” Mr Green said. The Tasmanian Greens today welcomed the passage of major local government reforms through the Legislative Council saying they will strengthen Tasmania’s democracy, but said it is disappointing that the opportunity to introduce compulsory voting was not seized. Greens Local Government spokesperson Tim Morris MP said that the Greens had long campaigned for these reforms including removing the dual representation capacity which allowed for an individual to be a local councillor and sit in the State Parliament at the same time. Mr Mayor, can the council write to the Molesworth Recreation Reserve Committee thanking them for their support during the local bushfire? The mayor advised that a letter will be forwarded to the Molesworth Recreation Reserve Committee. THESE are the questions without notice I asked at the January council meeting, and the answers received. Mr Mayor, how many disputes involving this council were resolved by confidential agreements in 2012? The mayor advised that he would take this on notice. At a subsequent meeting the general manager advised that the answer was "one". No further details were provided. Mr Mayor, can future agendas include a "business arising" section to enable progress to be detailed from the previous month's agenda? The general manager answered "yes". 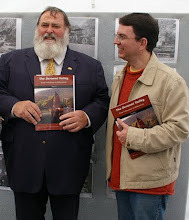 Mr Mayor, can the council make representation to the State and Federal Governments for all Derwent Valley and Central Highlands properties affected by the current bushfires to receive the same support and entitlements as those being made available to the Sorell, Tasman and Glamorgan-Spring Bay municipalities? Mr Mayor, can the council investigate whether a name is required for the laneway running off Pioneer Avenue and along behind St Matthew's Church? The general manager said this would be investigated. Mr Mayor, may councillors have an up-to-date list of staff and their responsibilities? THERE is considerable interest in two supermarket proposals that have been lodged with the council this month. A third-party developer this morning told ABC local radio that be believed these projects were worth about $15 million each. 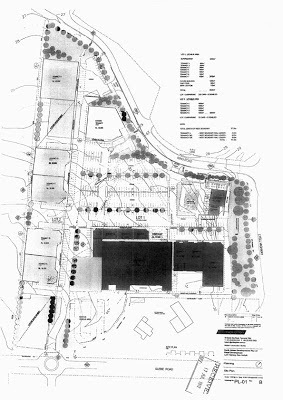 It's my understanding that the development proposed for the former Willow Court Oval consists of one large supermarket at the eastern end of the site, while the project proposed for a large tract of land bordered by Hobart Rd, Glebe Rd and Ring Rd on the former Royal Derwent Hospital site includes a supermarket, petrol station, fast food restaurant and specialty shops. The public comment period on the Oval project closes this Wednesday (January 23) and there is a little longer for comments on the Sadri development. I encourage anyone interested in these proposals to visit the council chambers to inspect the plans. For those who are unable to attend the council chambers in person, I am including the basic site plans for each project (below). I look forward to the day when all such documents are published online as some other councils are able to do. The Sadri Proposal. Hobart Rd is on the right. Click to enlarge. THESE are the questions without notice I asked at the November council meeting, and the answers received. Mr Mayor, I read in the Mercury last week that this council was supporting a local student selected to travel to Los Angeles. In what way is the student (Miss Elyse Barnes) being supported? The mayor said he was not aware. 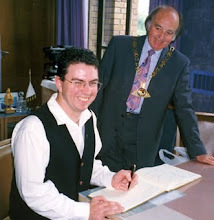 Mr Mayor, with my agenda papers I received a letter requesting that the council consider supporting young opera singer Bryony Dwyer with the cost of her fundraising concert supporting her internship with the Vienna State Opera. Why was this not on the agenda for discussion at tonight's meeting? The mayor said the council had donated $100 and he would be supporting the cause by attending the concert. Mr Mayor, what answer have you received regarding the maintenance of the historic watch house at Granton? The mayor said no answer had been received. Mr Mayor, what update do you have on your search for tunnels beneath Willow Court? The mayor said a little bit of work had been done and he was endeavouring to prove Cr Bester wrong. 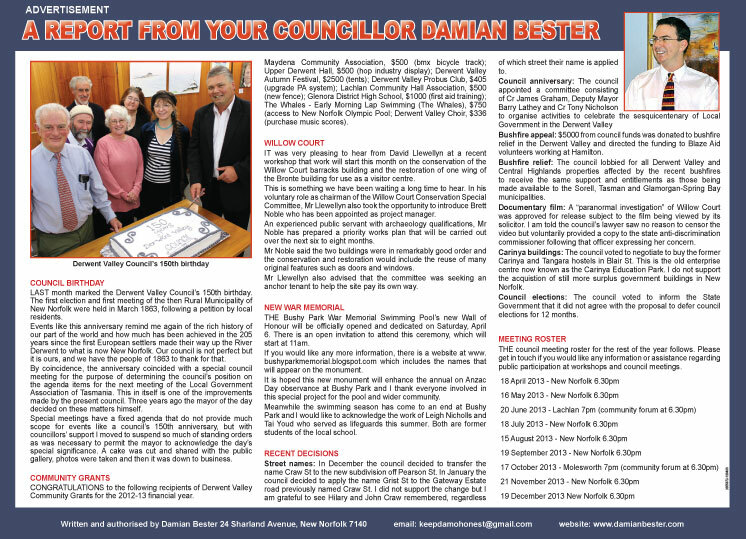 THE latest issue of the Derwent Valley Council newsletter (Spring 2012) was produced in December and is available for downloading from the council website here.